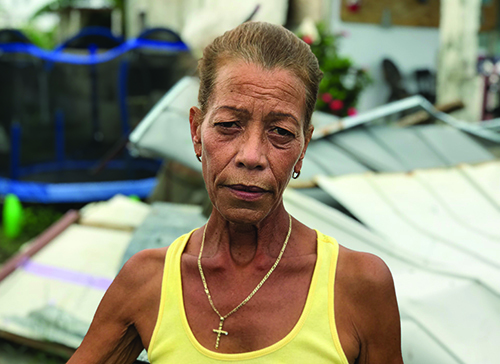 Lilliam Betancourt Lopez, a nurse practitioner and IAM Local 2725 member, received assistance from the Disaster Relief Fund after Hurricane Maria hit Puerto Rico. It was historic for all the worst reasons. The devastation caused by 2017’s hurricanes, ﬂoods and ﬁres resulted in at least $300 billion in damage—the costliest year on record for natural disasters in the United States. The price tag tells only part of the story. Lives and livelihoods have been lost. Families have seen their homes destroyed. Entire communities still wonder if things will ever return to normal. Machinists Union members were not spared. Hurricanes Harvey, Irma and Maria in the South, Puerto Rico and the U.S. Virgin Islands, along with fires out West, hit IAM families hard. When they needed it the most, their union was there. Here are just some of the stories of Machinists Union members rising up from hard times, and the generosity of their union Sisters and Brothers helping them get back on their feet. From sending planes worth of supplies to affected areas to donating money out of our own paychecks, the Machinists showed once again that our union is a family. José “Lole” Rodríguez Báez knows what pain looks like. Ever since Hurricane Maria barreled through the island in September 2017, the IAM member and Puerto Rico AFL-CIO President has spent most days dealing with the human effects of Mother Nature’s wrath. Puerto Rico’s signature blue skies and calm breezes have returned. But Maria’s howling winds, torrential rains and rising waters have changed the island forever. Lilliam Betancourt Lopez, a nurse practitioner and IAM Local 2725 member, lives about an hour-and-a-half east of San Juan. Months after the storm, she and all of her neighbors are still picking up the pieces. Her working-class neighborhood is a pile of ruin and rubble. A blue tarp, instead of a roof, now covers most of her home. Fortunately, Betancourt Lopez is not alone. She is receiving financial assistance through the IAM Disaster Relief Fund, made possible by generous donations of IAM members throughout North America. Chief of Staff, traveled to her town to deliver the check himself. The support brought her to tears. Her tears had turned to a smile by the time Negron said goodbye. He was going to deliver more relief checks to members in need. 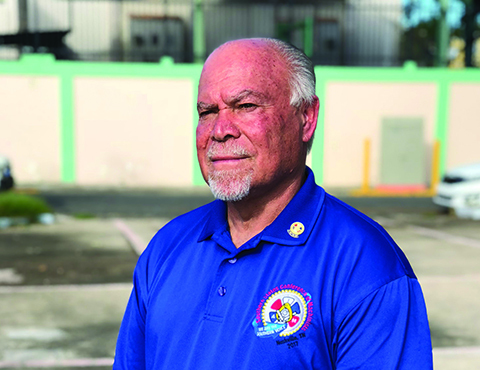 Betancourt Lopez is one of more than 1,000 Machinists Union members to receive assistance from the IAM since 2017’s scourge of destructive hurricanes and wildfires. IAM Districts and Locals—especially in the Southern and Transportation territories—have made the help possible. Rodríguez Báez has seen firsthand the resilience of the island he has always called home. Four months after the storm, more than half of the island was still without power and clean water. As the head union official in Puerto Rico, Rodríguez Báez has coordinated relief efforts to thousands of working families in need. He sees property destroyed and lives turned upside down on every corner of the island. In addition to visiting and assisting members, Rodríguez Báez has been outspoken about the need for more help for Puerto Rico. The void has made support and donations from IAM members on the mainland even more critical, he says. 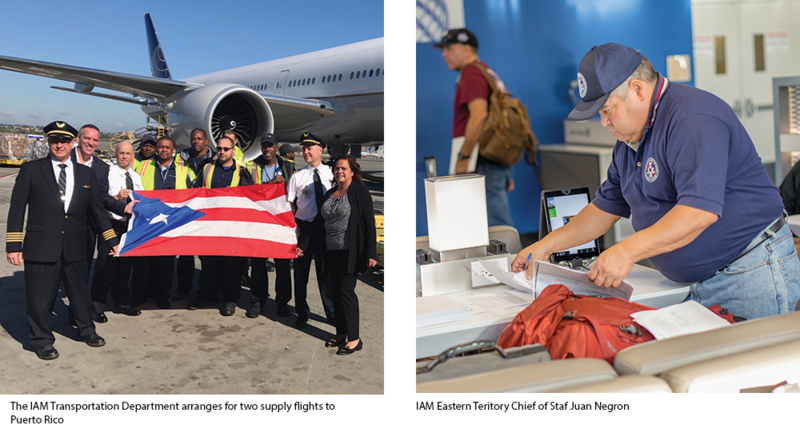 Solidarity was on display again when two relief flights, made possible by the IAM Transportation Department, along with United and American Airlines, brought hundreds of union volunteers and tens of thousands of pounds worth of supplies to working families in need in Puerto Rico. hall into a collection center for donations to Puerto Rico. Supplies ranging from bottled water to diapers were packed up and sent on a cargo flight headed to San Juan. A month before Maria tore through Puerto Rico, the Gulf Coast was bracing for the most powerful hurricane to hit the U.S. since Katrina in 2005. Southern Texas and Louisiana saw the worst of Harvey’s destruction. Houston was subject to the most extreme rainfall ever recorded in a major U.S. city. Most of the 5 million people in the Houston area received more than three feet of rain as Harvey stalled over southeastern Texas. The record-breaking deluge inundated low-lying Houston with the most widespread and severe flooding the city had ever seen. During the height of the storm, IAM Local 811 member Gregory Hall stepped out of his bed and into water. “I’ve never seen water rush so fast in my life,” said Hall. He ran outside, where the water was up to his chest and over his car. His garage, and both of the family cars, were completely flooded. The first floor of his house was destroyed. “That was stuff we really worked hard for,” said Mueses. 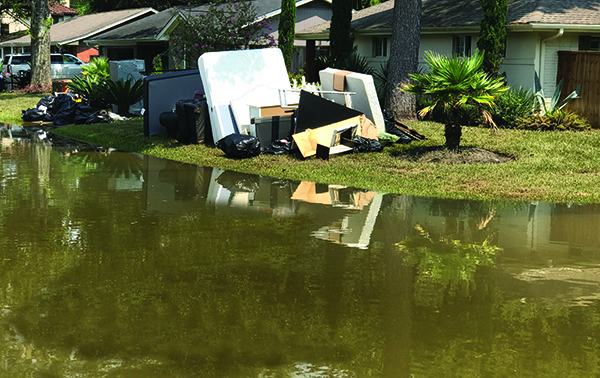 His family didn’t have flood insurance since their home was not designated as a flood zone. Houston communities made it through Harvey thanks to the bravery of people like IAM 2198 member Jorge Revuelta, one of several IAM members who set out on boats to rescue people from flooded homes. Revuelta and his son-in-law joined a fleet of boats in their community to help more than 20 neighbors escape rising waters before first responders reached the devastated area. Most were on second floors or roofs by the time Revuelta’s team reached their homes. Watching from more than 1,200 miles away were members of IAM Local 2385 in Fayetteville, TN. Moved by the images of destruction, they organized a road trip to Houston to cook meals for impacted communities. IAM District 711 in Nashville immediately began assisting the effort, and together the two organizations then started coordinating with IAM activists in Houston. Once in Houston, Local 2385 and District 711 set up a staging area in the parking lot of the Texas Gulf Coast Area Labor Federation, where they were soon joined by Houston IAM Locals 811 and 2198. Together, the groups cooked and delivered more than 750 meals to area labor unions, FEMA relief centers and religious institutions.